Happy Paws @ Unleashed is proud to offer professional pet grooming! Our highly trained groomers have been certified, and classically trained on standard show cuts for all breeds. Professional results at competitive rates! Please call, or come in to our shop for a free consultation with one of our groomers today! This will enable us to customize our service to your exact specifications. 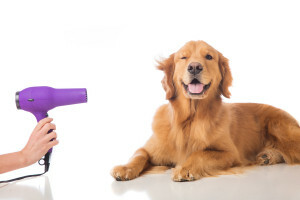 Prices will vary depending on the size of your pet, the condition of its coat and the complexity of the haircut. Bath & Brush Outs: It all starts here. Includes: Shampoo, conditioner, nail clip, ear cleaning, blow dry, cologne & light brushing. Perfect for the “low maintenance” pooch and the basic beginning to any groom! Prices range from $26 for the tiny Tea Cup breeds to $150 for the XXL Breeds. Full service grooming from the very basic shave down to breed specific shaping keep your higher maintenance pet looking their best. These are our specialty! Prices range from $35 to $200. Puppy Package: For pups 5 months and under. A low stress intro to bathing and grooming. Get your pup his or her first groom for the price of a self service wash. Highly recommended for puppies that will be getting grooms the rest of their lives. The Total Package: Our highest quality product chosen to be the very best for your dogs specific skin & coat needs. A facial treatment, nail manicure and teeth brushing. New Tricks for Old Dogs: Your senior deserves the best. This package includes a Ginko oil treatment and green tomato formula products to combat skin oder and coat elasticity problems brought on by old age. 911 Emergency: Long time no groom? When is the last time that coat saw a brush? Hasn’t been bathed in how long? Emergency grooming for the coat in need of some extra attention! Skunked! : Our special de-skunk formula. Flea & Tick: There is nothing we hate more than these pests! Kill them instantly with our medicated flea bath and prevent further infestation with a topical solution. Anti Fungal & Bacterial: Where all other treatments have failed, this one delivers amazing results! To be effective, we recommend this treatment is applied once per week until the issue is resolved. Consult your groomer for prices and package details. Stop the Sratch! : Relief is here! Includes Ginko oil to restore shine and luster, specialty products to target, sooth and purify irritated skin. Deep conditioning mineral mask for a healthy, soft, comfortable pet. Outdoors-Dog: “What did you roll in? You’re covered in mud! You aren’t coming in the house like that!” If this sounds familiar, then this package is for you. Includes heavy duty products to de-grease, de-muck, and de-stink your active outdoor pooch! Walk-ins welcome for nail trims, paw clean-ups, face trims and sanitary trims. $5-$15. Service Dog Discounts: Service Dog price for a self-service wash will be $12. Full service, professional grooming will be discounted 25%. Last wash one hour before close.